Tricia is currently producing a one-hour documentary titled Stable Life, which tells the story of a family of undocumented immigrants who live and work on the backside of a racetrack. She also directed the award-winning short films, Eighty Layers of Me (that you’ll have to survive), a documentary about former cheerleaders turned activists and We Got Next, a narrative about young women basketball players. Both films won numerous awards and screened at festivals throughout the United States. Tricia is the founder of FLACAFILMS, where she works as a director/producer and digital video editor. 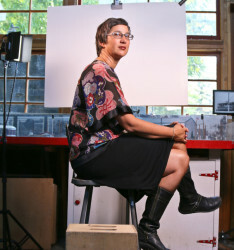 She has taught film/video production and documentary filmmaking in the Social Documentation department at U.C. Santa Cruz, San Francisco State University, Drexel University and in collaboration with several youth-related non-profit organizations. Tricia is a PBS/CPB Producer’s Academy Fellow (2008) and a Latino Producers Academy Fellow (2008). She serves on the Board of CreaTV San Jose, a community access television station and traning center. Tricia received her BA from U.C. Berkeley (Psychology and Chicano Studies) and graduated from San Francisco State University with an MFA in Film Production. She lives in San Jose, California, with her husband and two children. When I received the award, I felt like I was truly finding my place within the artistic community in San Jose. I'm still a documentary filmmaker. I've been able to work more extensively in San Jose since I received the award. I was delighted to direct a documentary on the history of San Jose titled "Changing Boundaries: The History of San Jose." It premiered last January at the California Theatre in San Jose and screened at Camera 12 in February. Work to develop your craft so that your core self shines through in your work; focus also on developing your business sense, so that you can fundraise and market your work effectively.